In February of 2008, Microsoft announced that it was purchasing cell phone manufacturer Danger, maker of the T-Mobile Sidekick line. The move seemed to be the first step at competing with Apple’s iPhone. Today, Microsoft revealed the first offer from the pair, the Kin One and Kin Two. The devices are being marketed as Windows 7 phones with a social slant. Far from being the mythical iPhone-killers that non-Apple users continue to lust after, the KIN series of phones is a mobile device that utilizes a Windows Phone 7 OS and has a heavy slant on social networking and online syncing. Hearkening more to Danger’s Sidekick than the iPhone, the Kin features a unique interface and a custom browser. It will feature full Zune support – including access to the Zune’s online music downloads and radio stations – but also allows works with Apple’s iTunes interface. There will not be any support for third party apps. The announcement comes as little surprise to those that have been following the rumors of Microsoft’s “Pink” phones. The Kin One, codenamed the “Turtle,” features a full QWERTY keyboard, 4GB of internal storage, and a 5-megapixel camera. 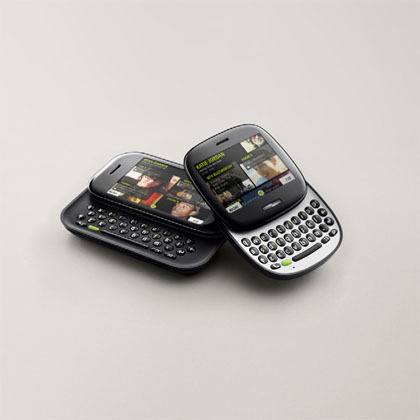 The Kin Two, codenamed “Pure,” also features a QWERTY keyboard, an 8-megapixel camera, and 8GB of internal storage. No word yet on pricing. The big emphasis is on social networking. Both Kin phones feature a home screen called the Kin Loop which automatically brings in feeds from Facebook, MySpace, Twitter, and other third party social networks. The phones also contain an original feature called the Kin Spot that allows users to share individual files – pictures, video, etc – without hosting them through other applications. A user can simply drag the file they want into the Spot, then choose with who, and how to share that file. “We built Kin for people who live to be connected, share, express and relate to their friends and family. This social generation wants and needs more from their phone. Kin is the one place to get the stuff you care about to the people you care about most,” Robbie Bach, president of the Entertainment and Devices Division of Microsoft said in the official announcement. The phones will be connected to a cloud system of servers that will give users the opportunity to store large amounts of information online then pull it up via thumbnails. Using the Kin Studio, everything the phone does can be backed up online. Videos, photos, even call history will be accessible to the user without taking up storage space. The Kin series will be exclusive in the U.S. to Verizon, and are expected to ship in May. Check out our photo gallery for more images of the Kin One and Kin Two.